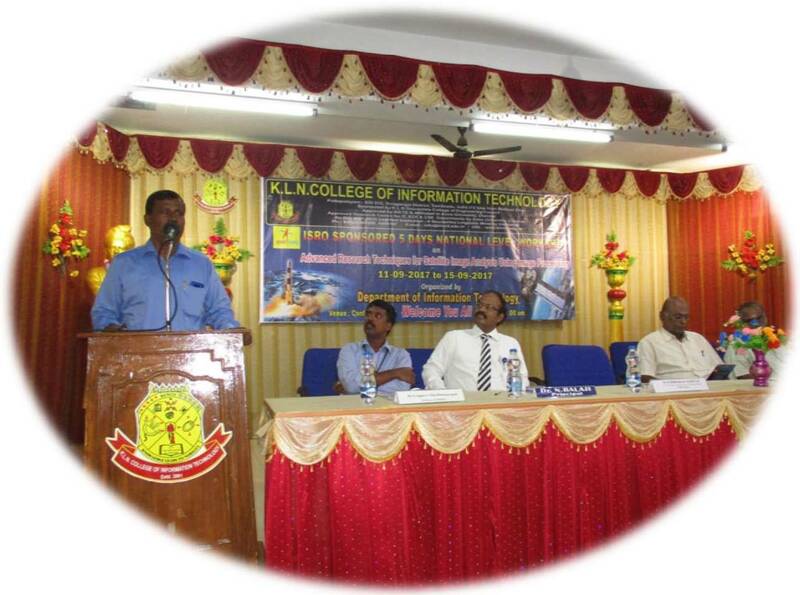 The Department of Information Technology was established in the year 2001. The Department has been accrediated by AICTE-National Board of Accrediation , New Delhi for a period of 3 years from June 2012 onwards. 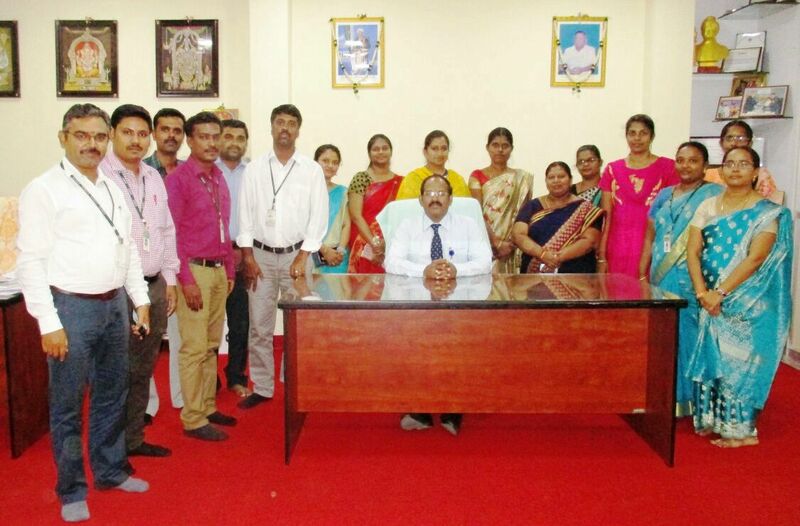 Our Department has well qualified and highly motivated Faculty members and Supporting staffs working closely together. 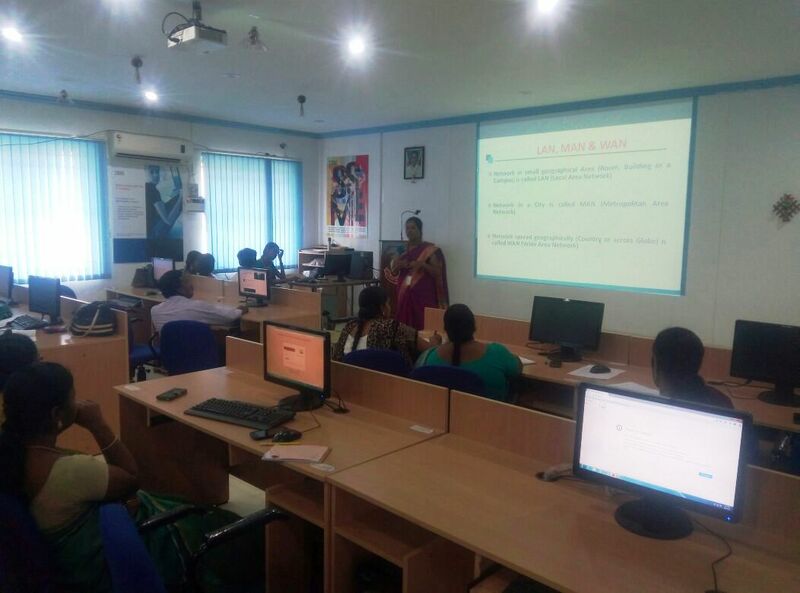 The Department has the State-of-the-art facilities with 4 well equipped Laboratories, Seminar halls, Department Library and Class rooms with LCD's. 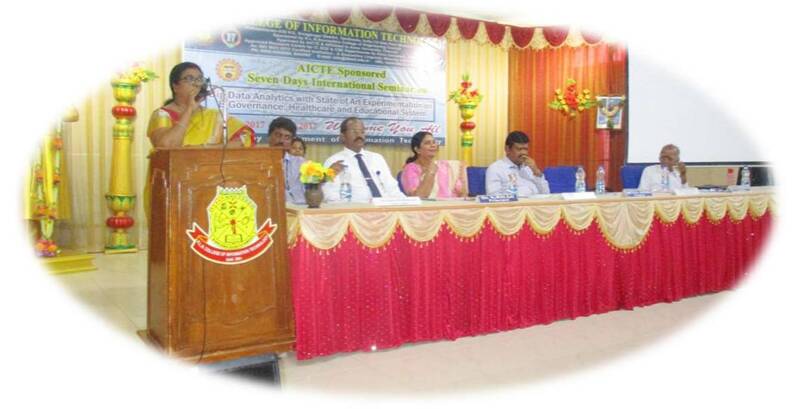 Our intention is to provide quality education to the students and impart IT excellence in them. Apart from making them good technocrats, we also provide individual attention to make them good citizens of our nation to serve the industry and society constructively. 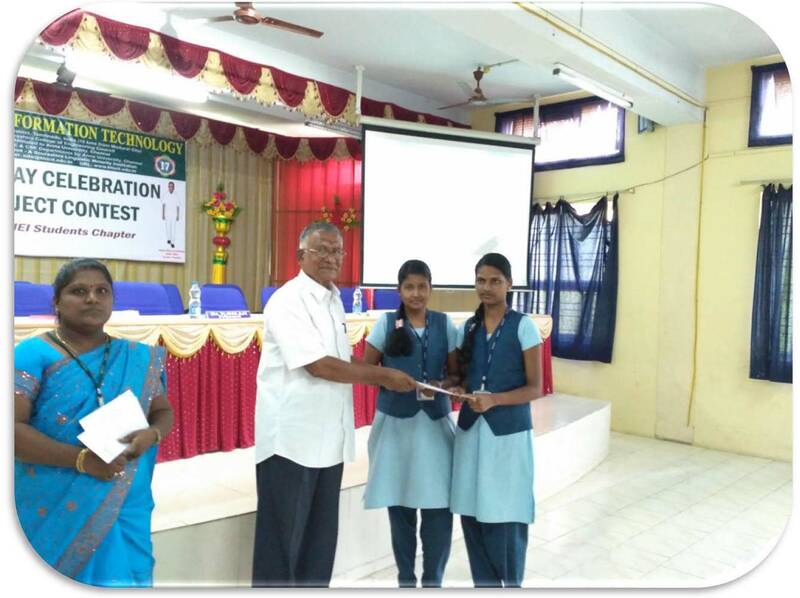 The POs are disseminated to the students during the inaugural function. It is customary to address all the new comers during the opening day. 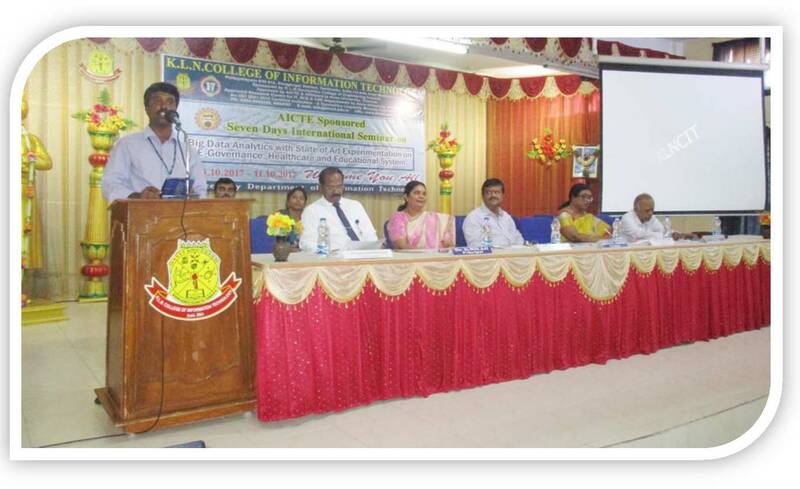 The gathering will be addressed by the principal, the respective department HOD and the senior professors in the respective department. 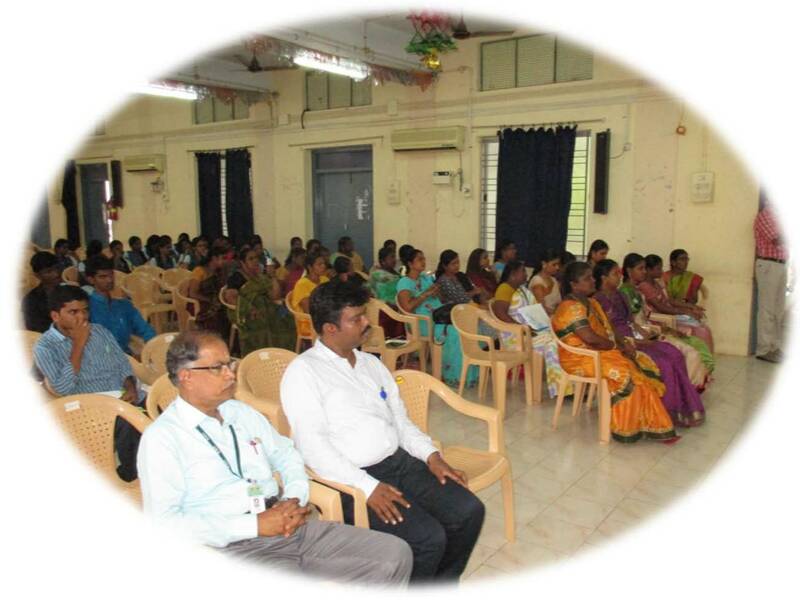 In this occasion, all they will focus their talks mainly on the scope of the programme, the future avenues related with the placements and the program outcomes. 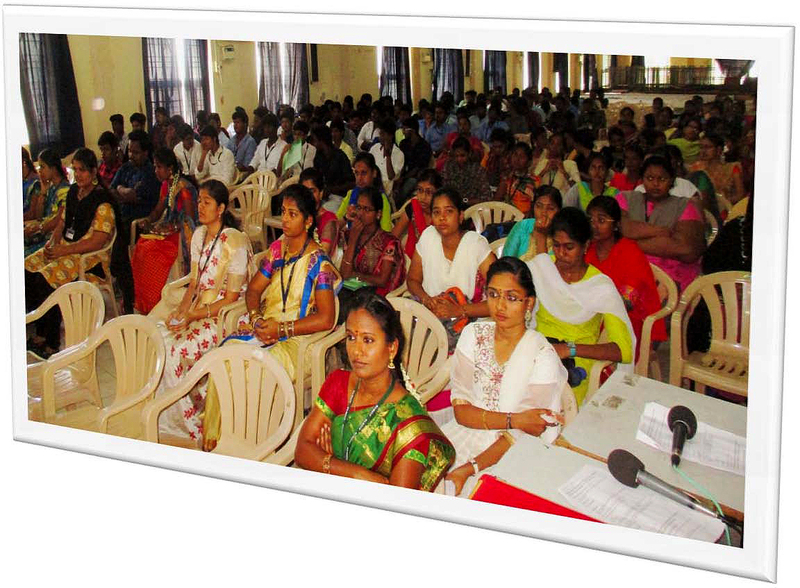 At the end of this meeting the students will clearly get into the objectives of the programme and its outcomes. 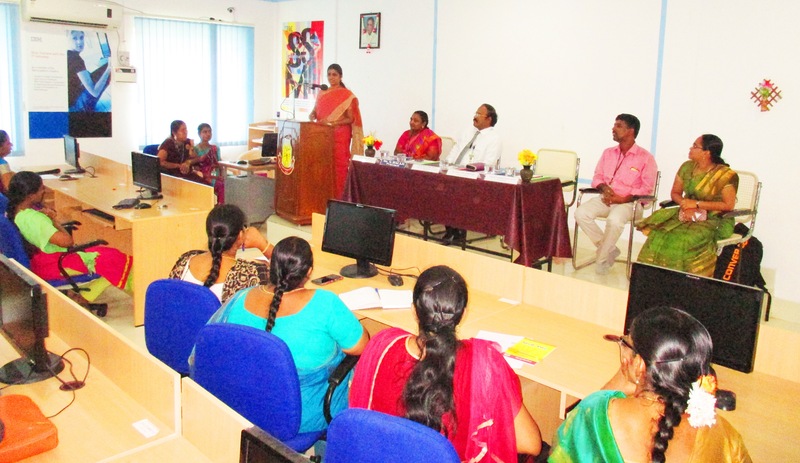 This meeting will also stimulate the young minds to achieve the program outcomes and thereby to start their professional career with positive hope. This meeting will be addressed by the HOD and the senior professors in the respective department. Mainly this meeting is planned to address all the students including lateral entry students and regular students. 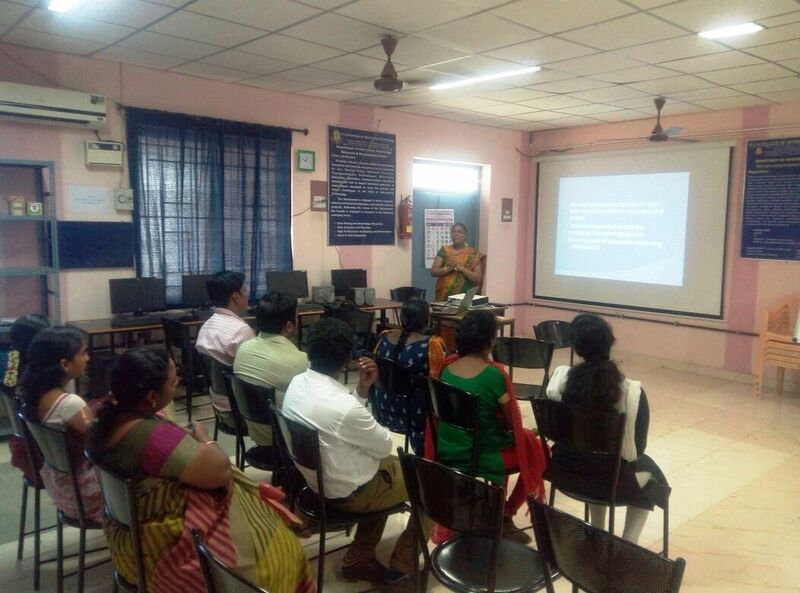 The theme of the meeting is to disseminate the course objective of core courses thereby to make the students to clearly understand the program outcomes. The Class committee meeting will be conducted periodically for each and every class the member of class committee consists of the HOD, class committee chairman, all faculty member handling classes for that class and five student representatives of that class. The objective of the class committee meeting is to monitor academic progress and any grievances related with academic activities. 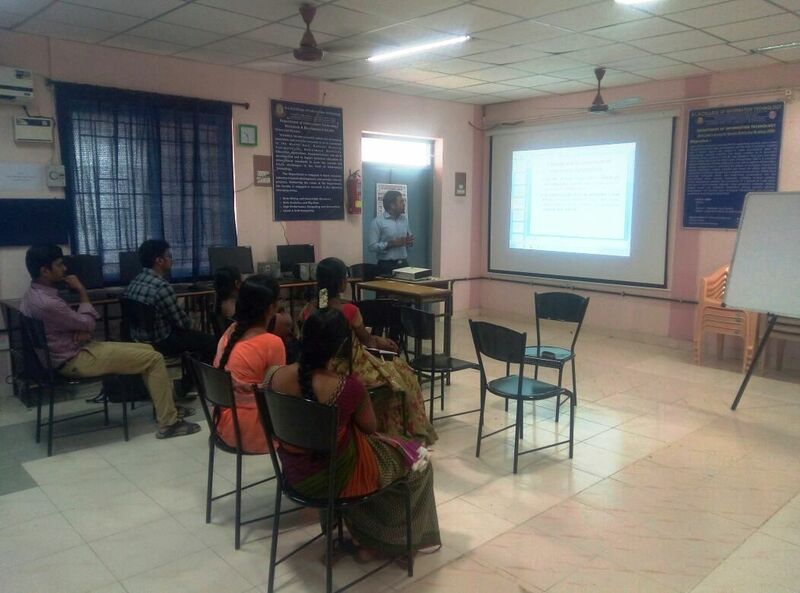 The class committee meeting is an avenue to disseminate the program outcomes and its importance to the students. 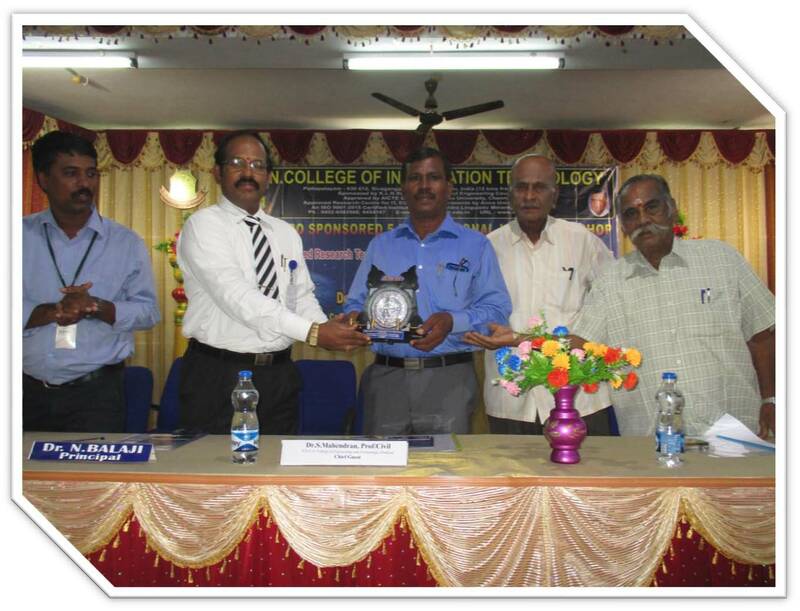 5 Mr.M.Devendran Asst.Prof. Completed NPTEL Course on Cloud Computing. 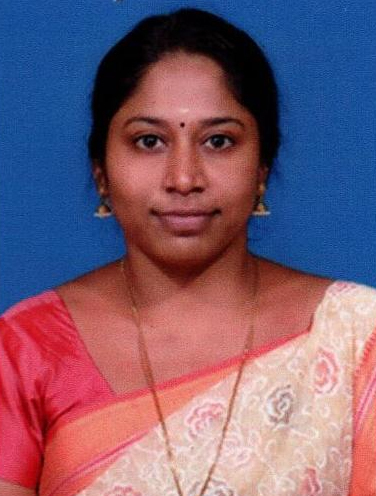 13 Ms.S.Thangamani Asst.Prof. 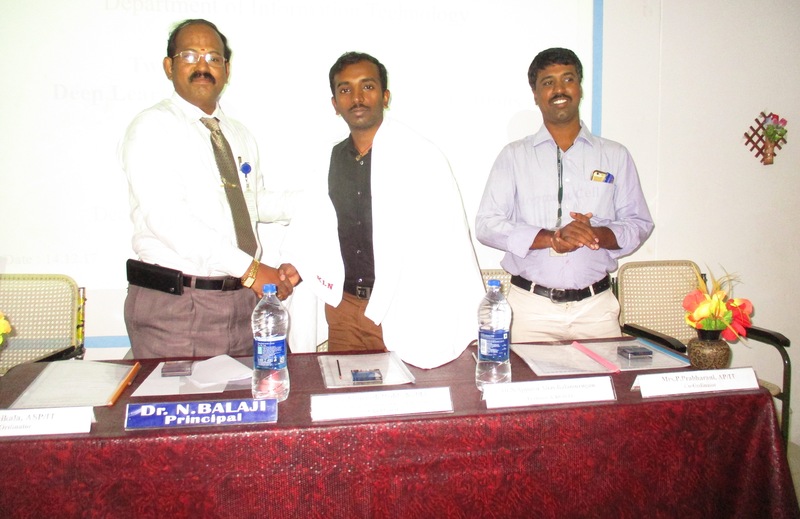 Completed NPTEL Course on Data Mining. 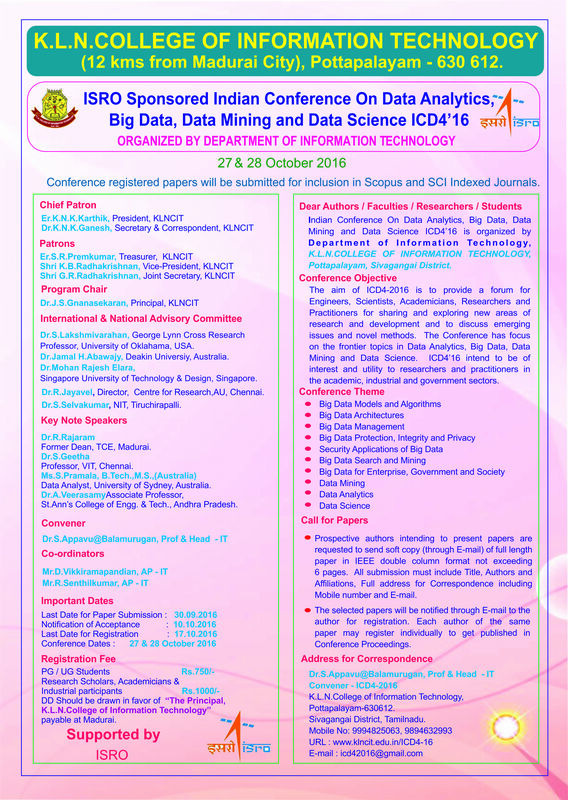 Attended two Days National Seminar on "Application of Cognitive Radio Communication for Remote Sensing in Disaster Management"
Participated and Presented Paper on 2017 International Conference on "Comparative Analysis of Image using Various Filtering Techniques"
Attended FDP on "IT6702 - Data Warehousing & Data Mining"
Attended three Days FDP on "CS6712 â€“ Grid and Cloud Computing Laboratory"
7 G.H.Ram Ganesh Asst. Prof. 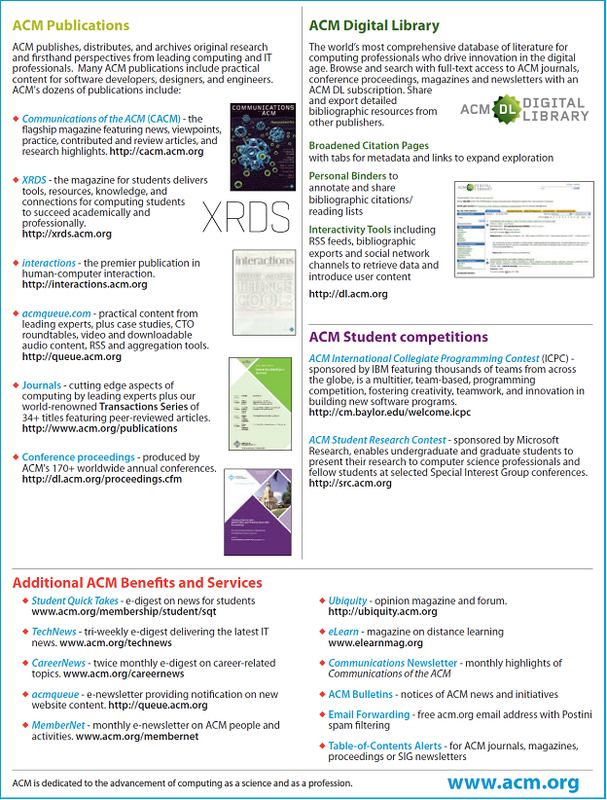 The Department strives for its students to have access to a high-quality Information Technology Infrastructure and Learning Environment to produce "Creators of Technology"
To serve the Community and the Profession. 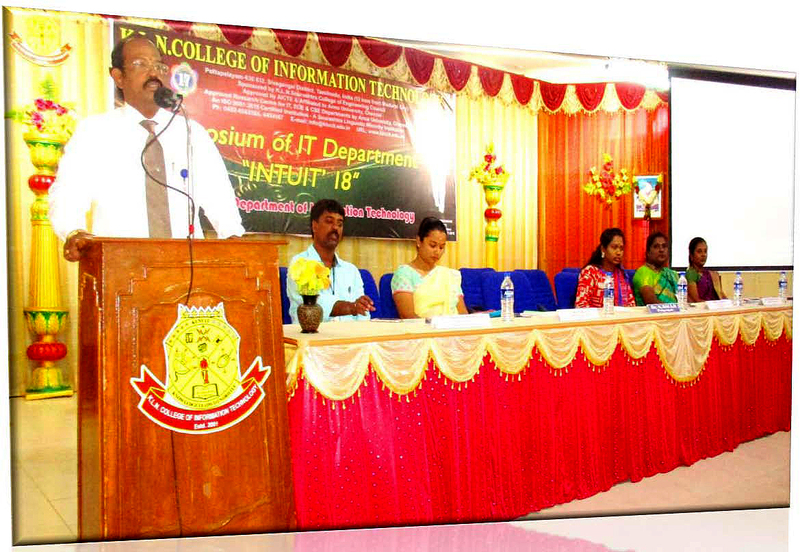 Graduates are prepared to be employed in IT industries and be engaged in learning, understanding and applying new ideas. 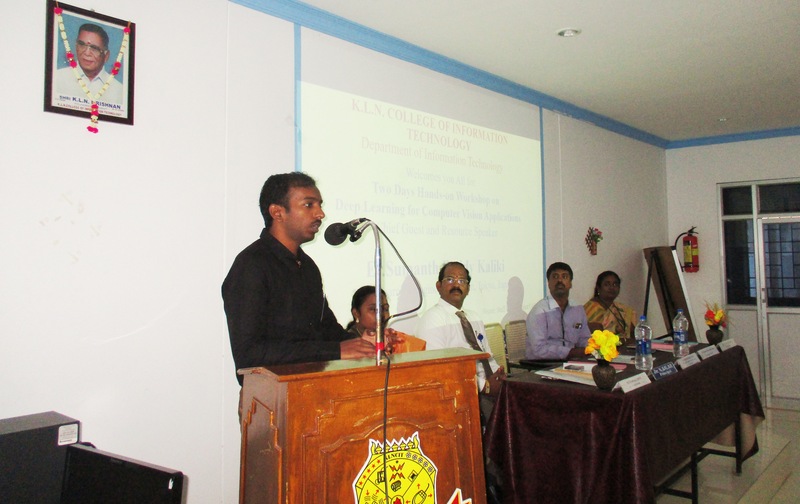 Graduates are prepared to take up Masters / Research programmes. 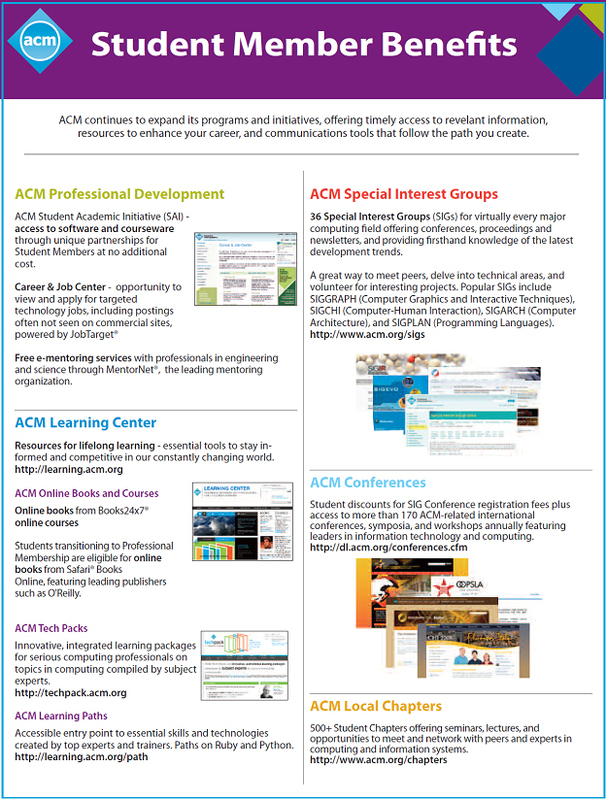 Graduates are prepared to be responsible computing professionals in their own area of interest. PSO 1 : Ability to use and apply current technical concepts and practices in the core information technologies of human computer interaction, information management, programming, networking and web systems and technologies by understanding of best practices and standards and their application. PSO 2 : Ability to identify and analyze user needs and take them into account in the selection, creation, evaluation and administration of computer-based systems in effectively integrating IT-based solutions into the user environment. LABORATORY DETAILS Department of Information Technology has TWO spacious laboratories, each provided with modern and sophisticated equipments to meet the curriculum requirements. To develop advanced Scientific and Engineering Application with Emerting Technologies. 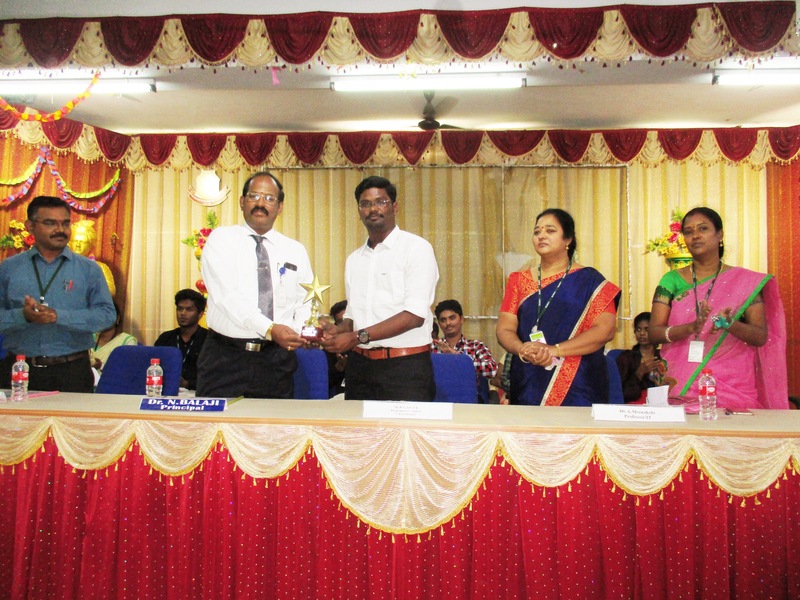 To be an out Standing Lab and aspire to recognized as good developer in the IT Industry. 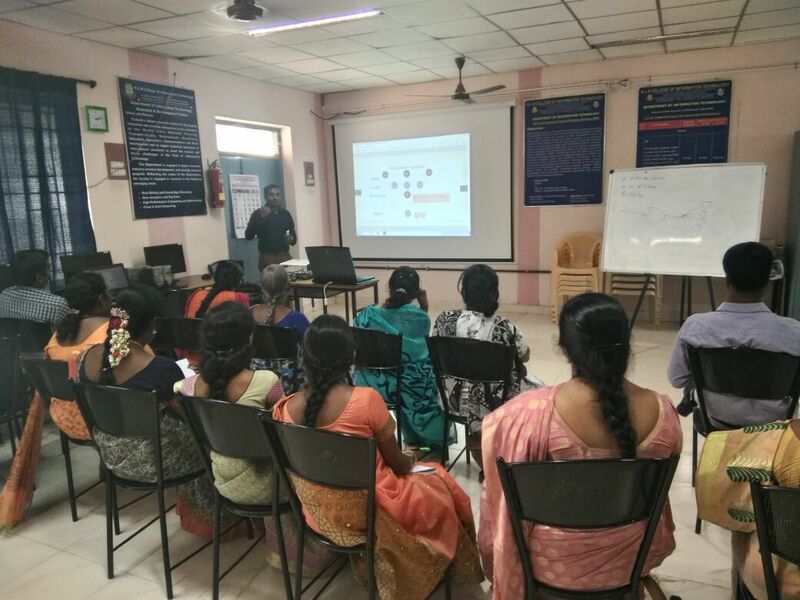 Provide Sound Knowledge in programming and analysis to solve real world problem with emerging technologies nature Students to involve in dynamic industrial needs. The primary focus of lab is on providing architectural support for efficient networking in high performance systems using cloud computing and to do storge and analytics of real time data of huge volume and variety. To explore and develop the next generation of intelligent machines, interfaces and environments for modeling, perceiving, recognizing and analyzing data by provide an environment for sophisticated IT research in leading - edge technologies in various domains. 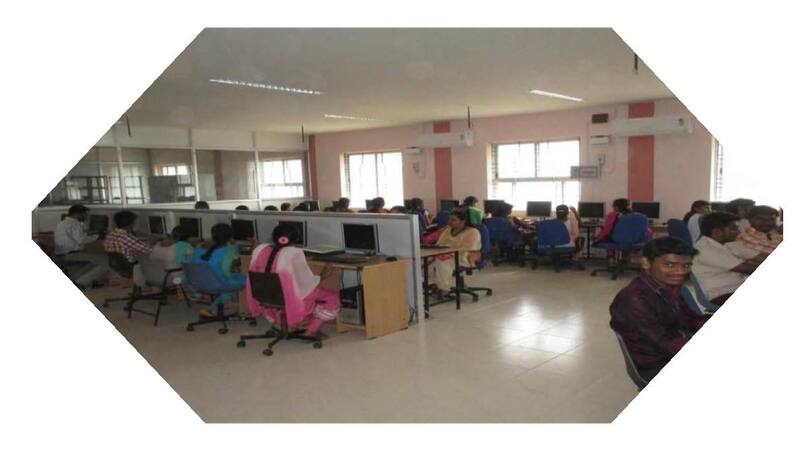 The Next Generation IT Lab, acts as a hub for the incubation of new ideas relating to next generation technologies like cloud computing, big data hadoop, mobile apps development etc in terms of strategy, planning, architecture design and development, quality assurance, develop solution approach and Proof of Concept. MS frontpage 2003 OLP edu. Adobe Photoshop 8.0 CS Win TLP Edu. 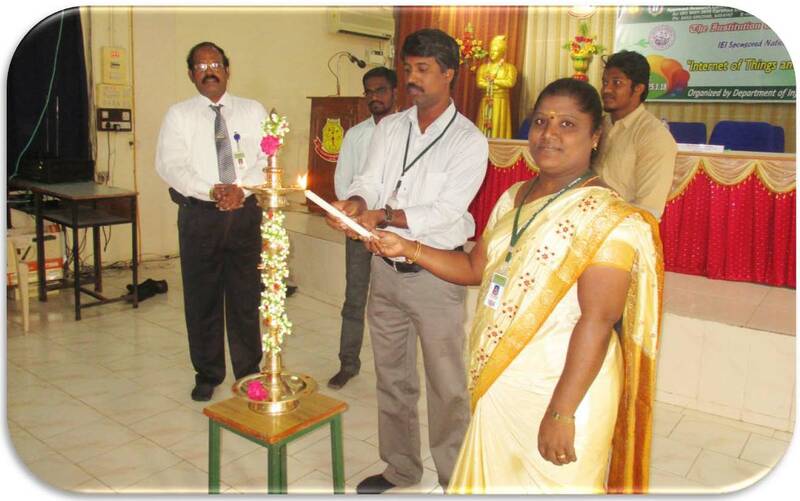 Ms. Revathi. A. M/s. Tech Mahindra Ltd., Bangalore. 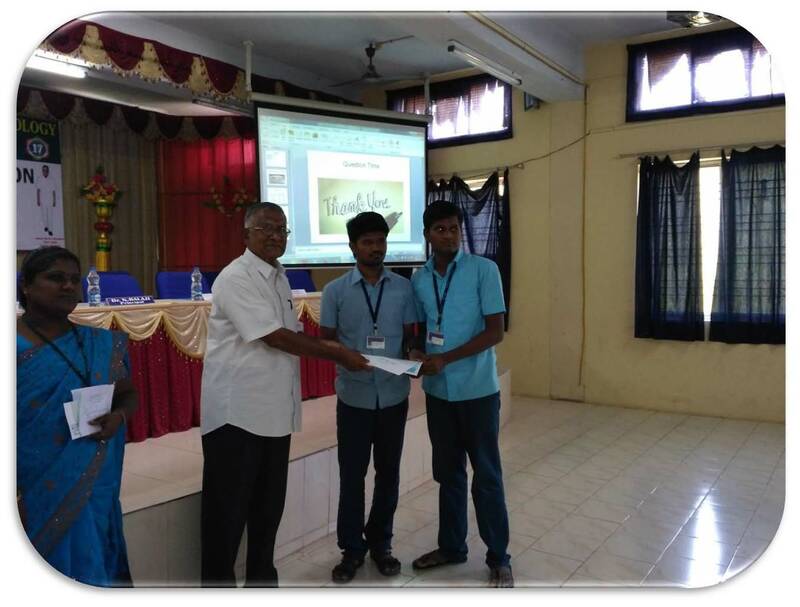 Participated in the Two Days National Workshop on "Java - An Industry Perspetive". 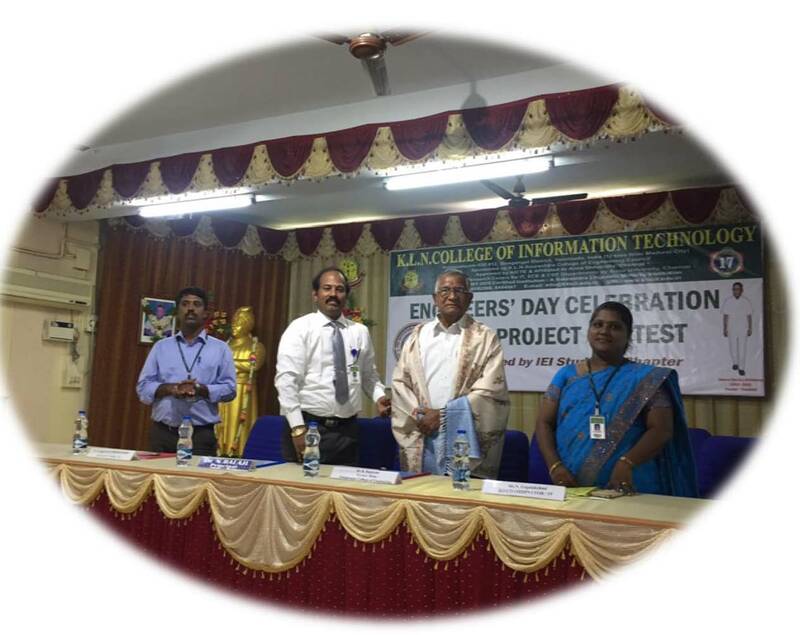 Participated in the Two Days National Workshop on "Java - An Industry Perspective"
Participated in the Event Design Eclat in "Techyuga'16"
Participated in Computer Society of India Sponsored Two Days Workshop on "OBJECT ORIENTED PROGRAMMING LANGUAGES"
Completed 3 hours online course of "Introduction to Pythn Programming"
Completed 3.5 hours online course of "Programming with Python: Hands-on Introduction for Beginners"
Participated in the event of "Code Chef, Quiz, Connections, Treasure Hunt"
Achieving an Eminent World Record under the theme "World Biggest International Hands-on Security Forensics Workshop"
Partcipated in "Code Chef, Quiz, Connextion, Flip flop, Treasure Hunt"
Completed NPTEL Online Course on "Introduction to Programming in C"
Completed Online Tutorial Course on "HTML Fundamentals"
Participating in "GLOBAL GAME JAM"
Successfully completed Training on "Optical Fibre Splicer"
Completed Course in "SQL Fundamentals"
Completed Course in "PHP Tutorial Course"
Completed Course in "JQuery Tutorial Course"
Completed Course in "HTML Fundamentals Course"
Completed Course in "CSS Fundamental Course"
Won second Prize in Mini Project Contest entitled on "Word Shuffle"
National Seminar on "Intellectual Property Rights"
Indian Council of Medical Research Sponsored National Workshop on Exploring the impact of Data Analytics in Healthcare"
Two Days National Workshop on JAVA - An industry Perspective. 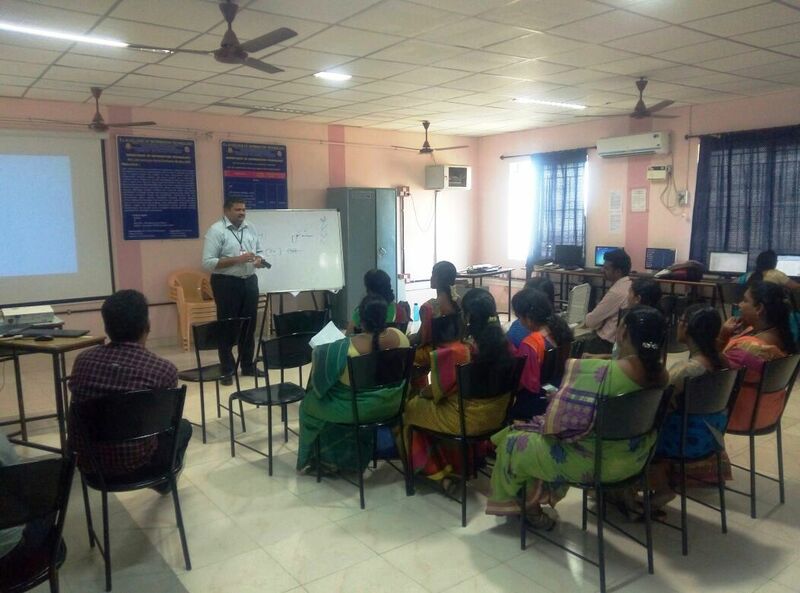 Two Days Workshop on "IT6711 Data Mining Labortory"
Faculty Development Workshop on "IT6611 Mobile Application Development Laboratory"
National Level Technical Symposium 'INTUIT'14' on 19thSeptember 2014 - IT Dept. 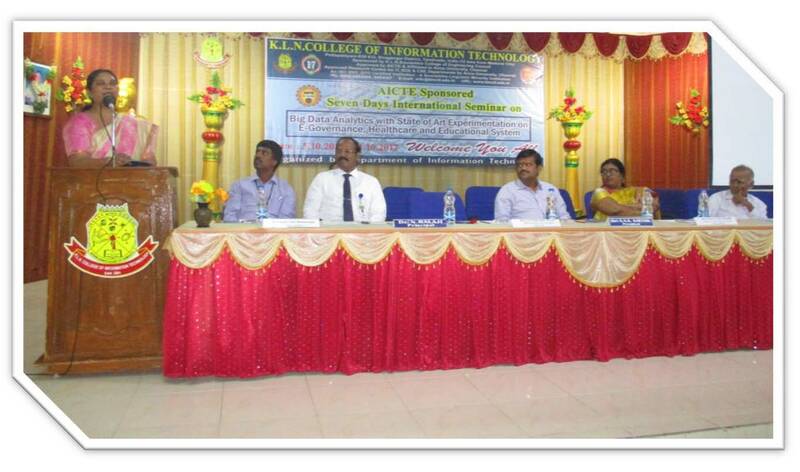 3 RRC Sponsored " RRC-Member Orientation/Training"
IEI Students Chapter was established at KLN College of Information Technology since 2011. 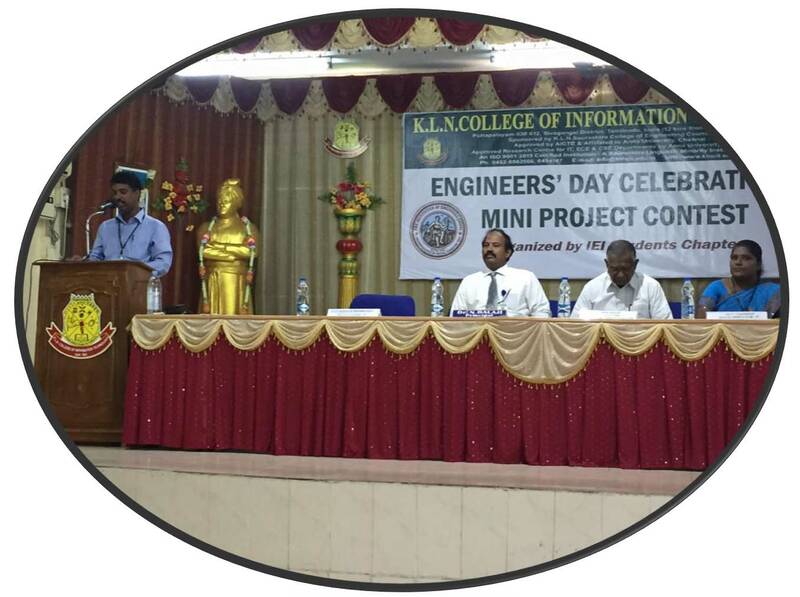 In Our College every year September 15th we conduct Mini Project Contest and Engineers Day Function under IEI students Chapter. 4 Nandha Kumar G K III Year NSS Camp Konthagai,Sivagangai Village. 5 Petchi Vignesh S III Year NSS Camp Konthagai,Sivagangai Village. 6 Prasanna Balaji T P II Year NSS Camp Konthagai,Sivagangai Village. 7 Manikandan M II Year NSS Camp Konthagai,Sivagangai Village. 1 PREMA.S II Year IT NSS Camp Konthagai,Sivagangai Village. 2 PRIYANKA.S II Year IT NSS Camp Konthagai,Sivagangai Village. 3 SAVITHRI.T.K II Year IT NSS Camp Konthagai,Sivagangai Village. 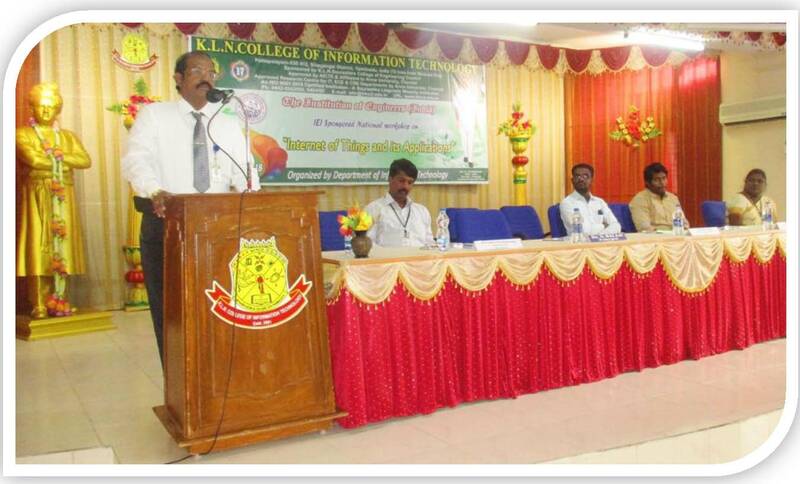 4 VISHALI.T II Year IT NSS Camp Konthagai,Sivagangai Village. 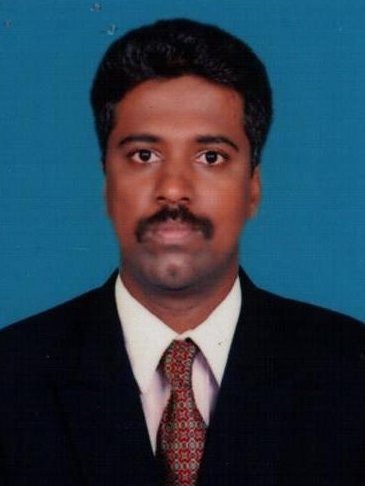 1 PRADEEP KUMAR.R III Year IT Guinness Record in Taekwando Queen Mira International School,Kochadai. 2 PRASANNA.T.E III Year Guinness Record in Taekwando Queen Mira International School,Kochadai. 1 KARTHIGA.A III Year IT NSS Camp Konthagai,Sivagangai Village. 2 DHARANI.O.P III Year IT NSS Camp Konthagai,Sivagangai Village. 1 SIVA RANJANI.M IV Year IT NSS Camp Konthagai,Sivagangai Village. 2 SWARNALATHA.K IV Year IT NSS Camp Konthagai,Sivagangai Village. 3 SUSMITHA.M.B IV Year IT NSS Camp Konthagai,Sivagangai Village. 4 SHANMATHI.S IV Year IT NSS Camp Konthagai,Sivagangai Village. Dept. of CSE, IIT Roorkee. 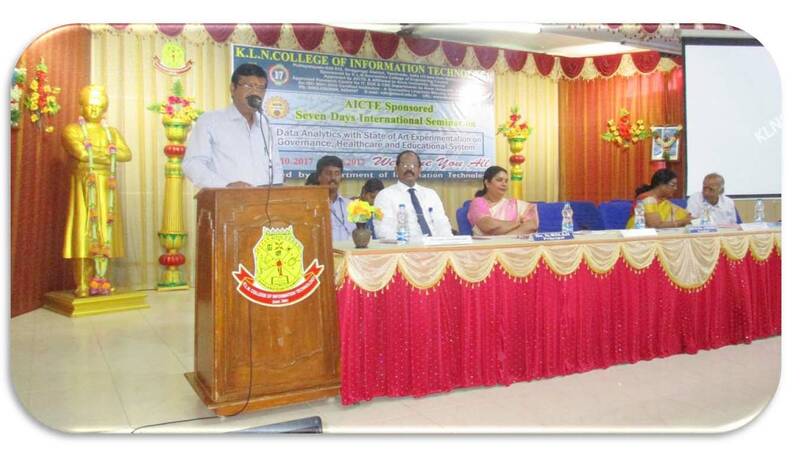 INTUIT is an annual National Technical Symposium organized by the Department of Information Technology. 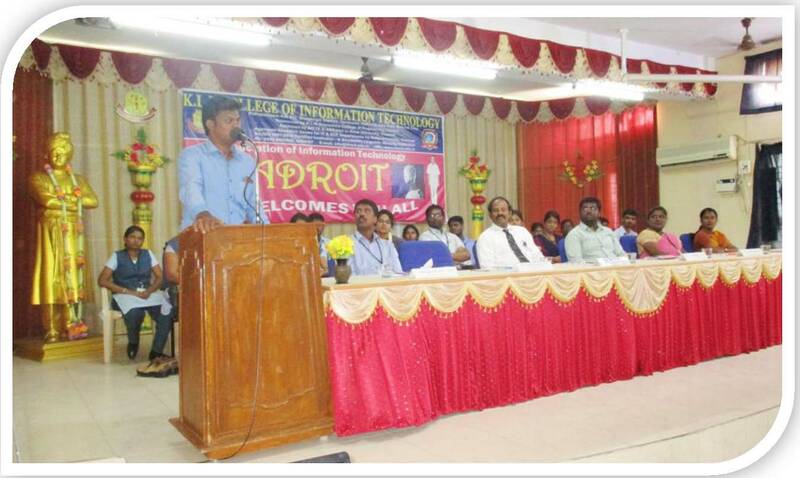 It is conducted by the Association of ADROIT. To exploit the talents of all young Engineers, INTUIT, attracts several hundreds of students from hundreds of colleges and universities across India. 1 2016 - 2017 2 1. Infosys Campus Connect Webminar Series on Java Programming. 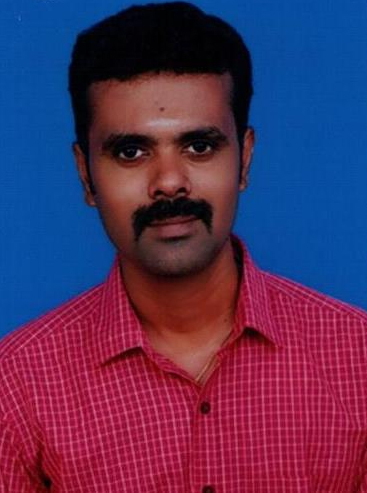 S.No Name of the Scholar & Course Type Anna University Supervisor No. S.No Name of the Faculty Register No. 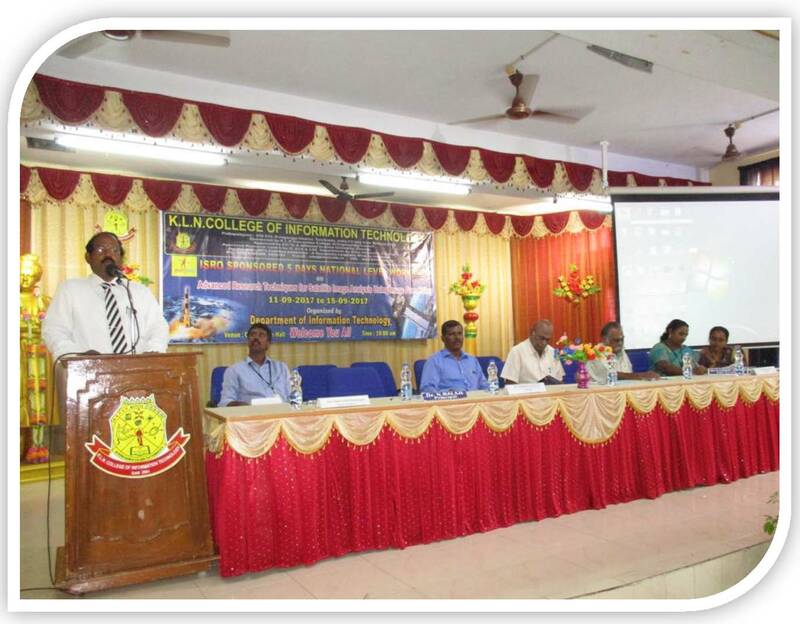 ISRO Sponsored 5 Days National Workshop on "Advanced Research Techniques for Satellite Imange Analysis using Image Processing" on 11.09.2017 to 15.09.2017 Chief Guest Dr.S.Mahendran, Prof. Department of Civil Engineering, PSNA College of Engineering, Dindigul. 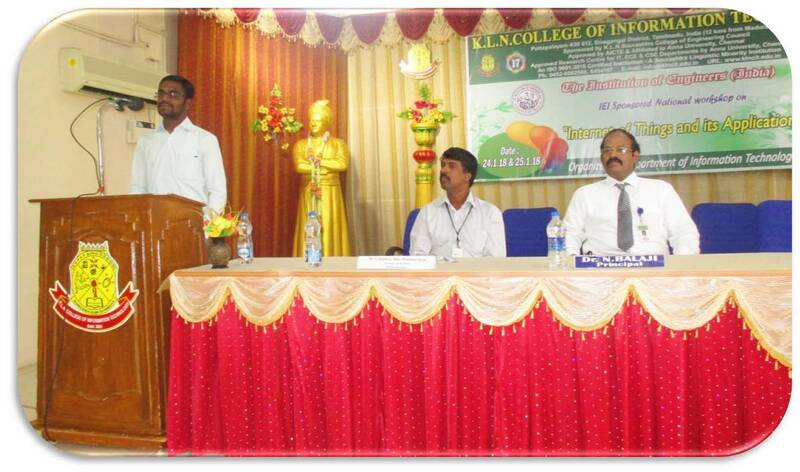 AP - EEE, Vaigai College of Engineering, Madurai. 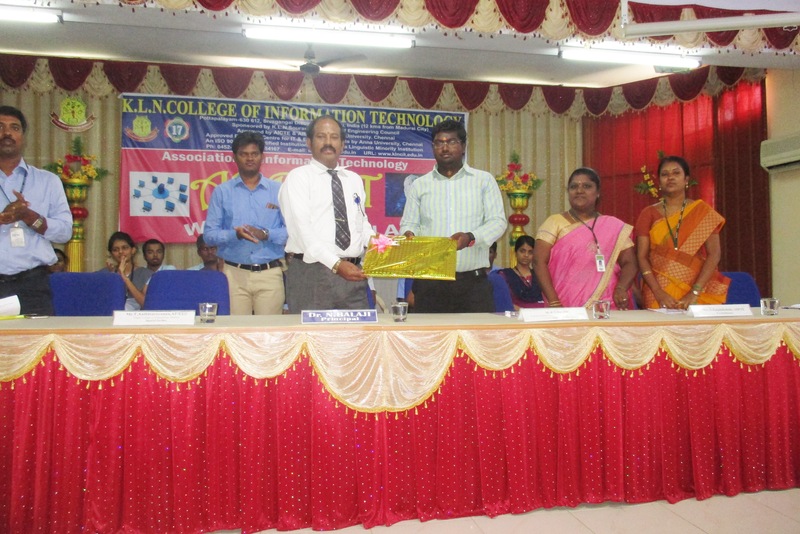 Mr.R.K.Durgesh, Developer and Software Engineer, Syntel International Pvt. Ltd., Chennai.